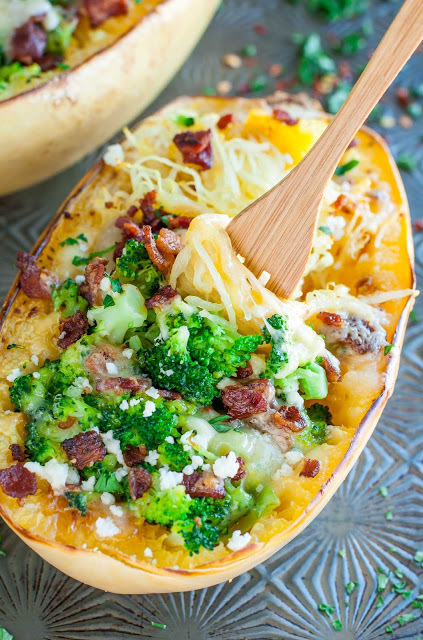 This Cheesy Bacon Broccoli Stuffed Spaghetti Squash is stuffed to the brim with tender broccoli, crispy bacon, and melted cheese. And You'll love it! I knew it was going to be good from the get-go, but was legit blown away with the first bite. And the second. And… you’ve got to make this sassified stuffed squash! This Cheesy Bacon Broccoli Spaghetti Squash is stuffed to the brim with tender broccoli, crispy bacon, and melted cheese. Love it! 4-6 oz chopped broccoli crowns or add extra! Slice your spaghetti squash in half lengthwise and scoop out the seeds. For easy cutting, feel free to stick each squash in the microwave for 5 minutes to soften it up just a tad. The knife slides through way easier this way! Rub the cut side of the squash with a teeny bit of cooking oil. Place inside a baking dish or atop rimmed baking sheet and roast face-down for 30-40 minutes, or until tender and easily pierced with a fork. Cooking time will vary a bit depending on the size of your squash, and the once rock-hard exterior of the squash will be visibly softened. While the squash roasts, steam or blanch your broccoli and cook your bacon. Add your broccoli, shredded cheese, and bacon, then season with salt and pepper to taste. Top with crumbled feta and bake at 350 degrees F for around 10-15 minutes or until hot and bubbly. For a golden cheesy topping, flip your oven to broil on high for just a minute or two until lightly browned. Garnish with parsley if desired and dig in! Short on time? The squash can be roasted and stored in the fridge if you'd like to meal prep and plan ahead for a speedier dinner. You can also microwave your squash in lieu of baking if you'd prefer. Get Cheesy! Choose your favorite cheeses to use in this dish. I used a combination of creamy Havarti and feta cheese. You could also use Mozzarella + Parmesan, Cheddar, Gruyere, Gouda, or anything your heart desires! 0 Response to "CHEESY BACON BROCCOLI SPAGHETTI SQUASH"